From Polish origin, Gene Krupa (1909-1973) is one of the first jazz drummers to went through a classical and US military drum study (with special rudiments as the "flams taps" for example, out of the European military tradition). He is one of the first drummers to benefit from the invention of the hi-hat pedal, that he quickly mastered to perfection. He is credited with the invention of tunable toms with screw rods (1936), making him the first drummer to play real melodies on drumset. He also collaborated with Avedis Zildjian to create the first splash cymbal (small and very thin, for the playing with stick and soft, in cabaret), in 1930. The scansion of each beat on the cymbal, in unison with the bass drum, the hi-hat pedal (beat 2 and 4 only), and the snare, to compete with the amount of the brass instruments of the orchestra, seems to be a technique of his invention, as well as the "rim shot", which consist of striking the skin simultaneously with the rim (or drum hoop). The syncopations (sometimes very irregular in polyrhythm 3 over 4) with the right foot during the breaks and solos, are also one of his trademarks, already announcing the modernity and freedom of bebop for the right foot with Kenny Clarke. Gene was the first modern drummer (jazz, with pedals) to have the honor of playing in a classical concert hall (Carnegie Hall in New York, with Benny Goodman, in 1938) and to be filmed in solo ("Sing, Sing, Sing", 1937). Benny Goodman has also formed a jazz quartet mixing black and white people, with Gene Krupa, Teddy Wilson (piano) and Lionel Hampton (vibraphone), marking a major step to found an American identity beyond cultural divides of immigrants and racism. 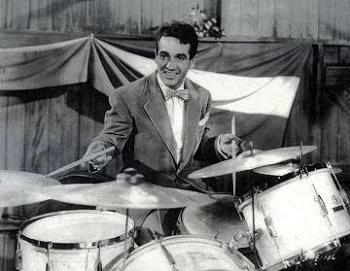 First "star" of the modern drumset (with Chick Webb probably at the same time, with whom he will make "Battles of the Bands" at the Savoy Ballroom in New York), Gene appeared in films highligthting his solo playing (such as "Shadow Rapsody", in the film "Beat the Band" (1947), or "Ball of Fire" (1941) where he plays his own role by playing an amazing matches solo on matchbox), inspiring many drummers and vocations, as Buddy Rich ( with whom he will make "Drum Battles", filmed and recorded in public), Louie Bellson, Steve Gadd or Ian Paice. His modern drumset method of 1938 is the first truly accomplished in history and already describes the famous "Moeller" technique (playing with hits alternating), of which he was a student, thanks to detailed photos, and exercises with accents and paradiddles in syncopation, which will later be the basis of the jazz-rock drumming of Steve Gadd or Jack DeJohnette. 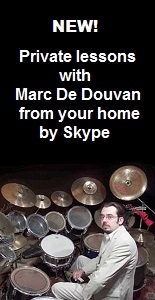 His method still remains a reference for learning the drumset in the United States, demonstrating his extraordinary avant-gardism and presented initially mostly a vocabulary to allow the drummer to express himself and to improvise (such as gestures, classical american and original rudiments (including in syncopation and polyrhythm, typical of jazz) and elementary exercises for the independence of the 4 limbs), focusing well to describe invisible or incomprehensible details for a spectator, also thanks to many explanatory texts, like I've tried to do in my own pedagogy (on this website and in my methods).